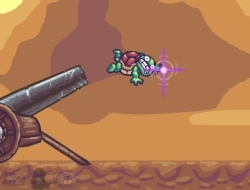 In this shooting game the turtle is tired of being slow and never taking part in any races against the other animals. Well now it is time for you to help it by shooting it out of the cannon. It has a very tough armor so you can land on bombs without a problem, in fact they will launch you back in the air. Try to control it in the air and make it land on the money bags for extra dollars or on land units which will usually make it go even further, but watch out for the spikes as they will end your flight a bit short, but they also add a bonus amount of money if you get your turtle impaled in them. Try to make the most out of each flight and buy all the upgrades to be the best flying turtle. Use the mouse to aim and shoot the turtle. Toss the Turtle 0.00 between 0 and 10 based on 0 votes.